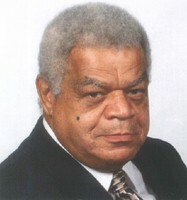 William Edward "Pete" Peters Sr. Provide comfort for the family of William Peters with a meaningful gesture of sympathy. William Edward “Pete” Peters Sr., 83, widower of James Perry “J.P.” Peters, who passed away Thursday, December 27th, 2018. He was born November 15th, 1935 in Danville, Kentucky, son of the late Sallie Searight and he was raised by his grandmother, Lizzie Searight. Pete was a member of Consolidated Baptist Church in Lexington. He was a multi-talented individual, who started as a student of Electrical Engineering, and later worked as a Landscape Designer, Hospital Orderly (Eastern State Hospital and The VA Medical Center Lexington, Ky ), Sinclair Gas Station owner/operator, Educator/ Administrator (Job Corps), General Building Contractor, Licensed Master Electrician, Certified Instructor of Master Automobile Mechanics, Electrical Inspector, and Cemetery Caretaker. Pete became an Educator/Administrator at the Camp Atterbury, Indiana Job Corps Center, starting as a Resident Advisor, and progressing through several management positions. He was certified by the State of Indiana, teaching Automobile Mechanics Class during this period. He was mentored by the Camp Atterbury Job Corps Center Director into management, and later served as the Job Corps Center Director at Camp Atterbury, Indiana; Dayton, Ohio, and Bronx, New York facilities. Pete was the caretaker for the Maple Grove Cemetery, Georgetown, Kentucky, which was founded by the Knights of Pythias. He was the last surviving member of the Knights of Pythias Georgetown Lodge. Pete wanted to maintain the cemetery as a non-profit so that there would be an affordable cemetary burial option for the African-American community of Georgetown. He is survived by his daughter, Glenda N. Peters; three sons, William E. (Kyong) Peters Jr., Gerald K. Peters and James P. (Leslie) Peters II; nine grandchildren, LaShanta “Nikki” Peters, Raphael Watts, Andrew (Emily) Watts, William E. Peters III, Kirtley (Alex) Karpodinis, Adrianna Peters, Richard (Kimber) Peters, Christopher Peters and Joseph Peters; four great-grandchildren, Nataniah Jackson, Albert Watts, Wesley Watts and Bishop D’Artagnan Peters; a loving sister, Lorene Hutson; a special “daughter”, Gail (Gregory) Figgs; his best friends, Philip “Hank” Finley and Larry “Ike” Johnson; a host of nieces, nephews, cousins and friends. In addition to his parents and wife, Pete was preceded in death by a daughter-in-law, Yvonne Peters; one sister, Katherine Love; one brother, James Meaux. Visitation will be Thursday, January 3rd from 5 to 8pm at Johnson’s Funeral Home and then on Friday from 10am until time of service at 11am at Consolidated Baptist Church, 1625 Russell Cave Road, Lexington. Burial will be in Maple Grove Cemetery, Georgetown, Kentucky. To plant a memorial tree in honor of William Edward "Pete" Peters Sr., please visit our Heartfelt Sympathies Store. 0 trees have been planted in memory of William Edward "Pete" Peters Sr. I am very sorry for your loss. You can find a comforting scripture in your Bible at Revelation 21:4. Almighty God, Jehovah promises that death will be done away with. He has the power and is eager to remove death. His Son, Jesus Christ also promised that the dead will live again and will live forever under peaceful conditions. Please go to jw.org for more comforting thoughts. Again, I send my condolences. I just saw the news about the passing of Mr. Peters; i'm truly sorry for your loss. Mr. Peters served on the Planning Commission while I was the Planning Director and I got to know him during my time. He would often meet with me to ask questions, learn more and also to share stories about different things (and times); I really enjoyed our talks. Mr. Peters will be greatly missed. Please accept my sympathy for the death of your dear Mr. Peters. Your heavenly Father shares the loss also (Ezekiel 18:32). He has wonderful plans for his future (Hosea 13:14; Revelation 21:3-5). Here is the link to a video about the hope for our dead loved ones that has greatly helped me over the years: https://www.jw.org/finder?srcid=share&prefer=content&applanguage=E&locale=en&item=pub-imv_4_VIDEO&docid=1011214. I sincerely hope it will benefit you as well. My heartfelt condolences to all of you. Psalm 37:11, 29; Philippians 4:6-7.